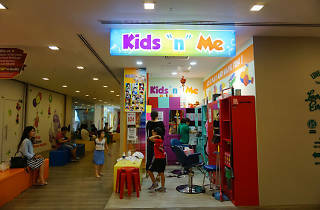 If your kids would rather become Rapunzel than get their hair cut, maybe it’s time to make an appointment at Kids ‘N’ Me. The stylists’ trick to getting children to sit still in the kid-sized barber chair? Using regular scissors instead of the traditional metal clippers that make sounds that some children are afraid of. There is no age limit and parents can get their hair cut by them, too. Prices start from $24. Worst haircut ever for the baby! Don't EVER come to this place. Baby's hair was unevenly cut, hairstylist's hands were shaking and a straight fringe became a slanted one. Could not even handle the scissors and comb well. Worst experience for a baby ever. You'all regret it if you patronize this place.